One of our clients submitted to us details on his Anveo API implementation for a children's dentistry office. "Missed appointments" are very bad for any medical practice. A single missed appointment a week may cost well over $20,000 in lost annual revenue. One of our clients has implemented an automated appointment reminder for a busy medical office. The appointment reminder solution calls patients during evening hours 2 days ahead of the appointment to remind them of their scheduled appointment and to bring their insurance information with them. Patients can press 1 on the phone keypad to be connected to the medical office to discuss details or make changes. The Medical office already had an appointment tracking system that was using an MS Access database. My job was to build a simple application to pull a list of patients whose appointments were scheduled two days out and to schedule an automated reminder call via Anveo's API. To do this, I created a simple VBScript application to be run on a daily schedule. 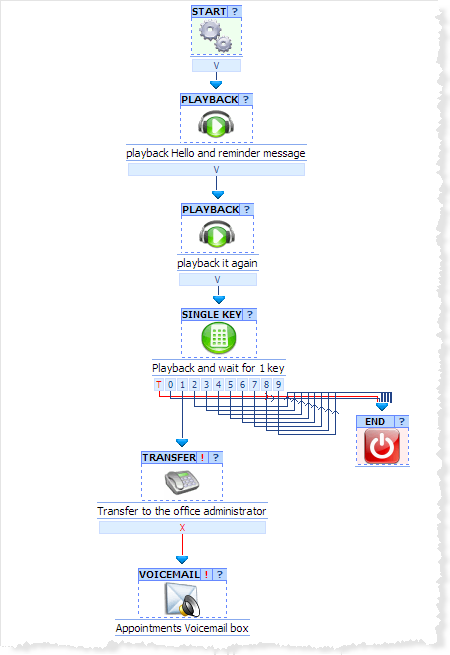 A simple Anveo IVR Call flow was configured to playback reminder messages (2 times). In the message, the patient is asked whether they want to talk to the office to either cancel or reschedule their appointment. If they respond affirmatively, the patient is connected with the office. As far as implementation time, it took about 2 hours to finish my application plus another hour to install and configure it in the office. From what I know, the business owner is very impressed with the results and their patients have been very appreciative.